Where a river begins and ends is not decided by nature. Rather, it’s a subjective process that often varies between indigenous and colonial cultures. For instance, American settlers understand that the Allegheny River flows into the Ohio River at Pittsburgh, while the Haudenosaunee (Iroquois) understand them as one river, called Ohí:io. And what settlers call the Tennessee River actually has many names in Yuchi – Chaovannon, Kallamuchee, Kaskinampo, Callamaco, Cootela, Hogohegee, Pellissippi, Nonachunkeh, Euphasee – depending on which tributary is honored as the main branch. * Bemijigamaag-zaaga’igan (Traversing Lake) – Lake Bemidji and Lake Irving. These are considered a single lake in Ojibwe. 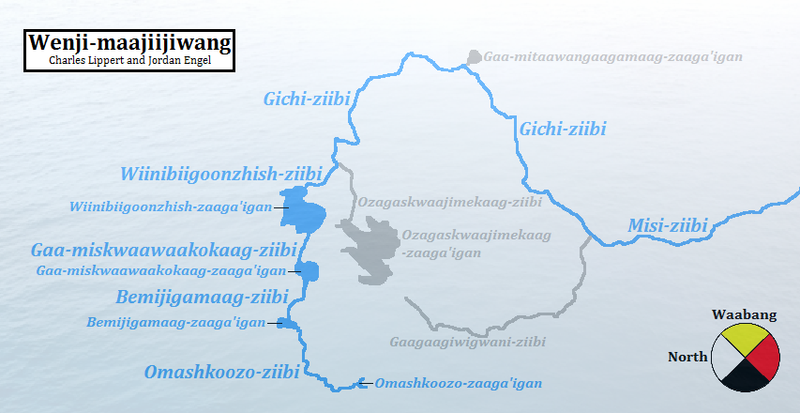 * Gaa-mitaawangaagamaag-zaaga’igan – Big Sandy Lake. For the Gichiziibiwininiwag (Mississippi Ojibwe), Big Sandy Lake is a culturally important location. ***A note on the compass – The Anishinaabe traditionally orient themselves to the East, which is why East appears at the top of this map. Because the standard orientation is different in European and Anishinaabe cultures, we’ve included the English word “North” and the Anishinaabemowin word “Waabang,” meaning East, on the compass. The compass rose itself is in the form of a medicine wheel, an indigenous symbol used across the continent to denote the four directions. This was incredibly helpful with my linguistics research project!